Take a break from Thanksgiving family dynamics and enjoy these photos of our recent tile installations in the UNC men’s basketball locker room at the Dean E. Smith Center in Chapel Hill. Mud bed floors flowing to 12 different drains, large-format glass in an expansive area, polished stone, 2×2 mosaics, large-format porcelain in multiple sizes, and honed decorative stone made this one a technical treat. Thanks to Vision Contractors and the facility managers and coaches for adding us to the team for this special, world-class project! Categories: Glass Tile and Natural Stone, Tile installation expertise | Tags: Glass tile, Glass tile installation, natural stone, tile contractor, tile installation, tile professionals, UNCbasketball | Permalink. Why can’t you match my stone? We’ve been asked to address a problem with a small crack running through the marble in an entrance area. While the underlying problem is movement in the concrete slab under the tile (installed by others), an additional issue is matching the stone. Natural stones like marble are just that — natural. The chances of duplicating the colors and veining in marble after several years are like finding the proverbial needle in a haystack. 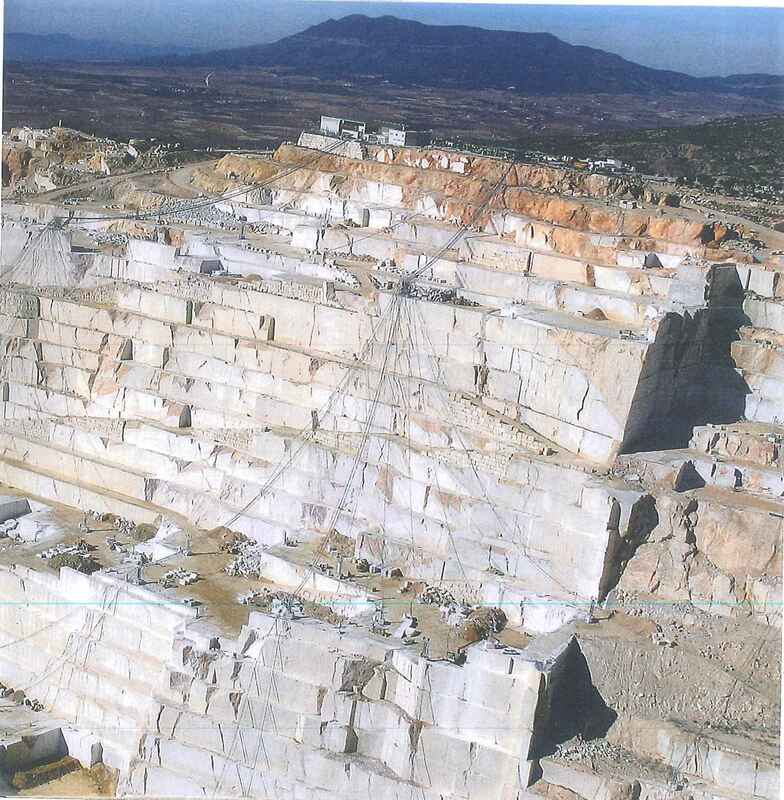 As you can see in this photo, marble is cut in quarries (this one 490+ feet deep so far) which produce tons of material each year. This material is shipped over the world, and tracing it back to a particular point of origin is often an impossibility. While we can order samples, and try to get close, it’s doubtful that we’ll be able to keep the consistent look of the original installation. So, does the customer learn to live with the crack, accept an area of marble that isn’t the same color as the original, or remove the entire area and replace it with a new material? Here’s the caution from us: When natural stone is used in an installation, it is imperative that extra material be ordered and stored as ‘attic stock.’ Make sure you ask your installer to order extra materials, and be sure you store them in a safe place so they’ll be available should you ever need them to preserve your installation. Categories: Glass Tile and Natural Stone, Installing tile and stone, Tile Repair | Tags: cracked tile, Installation expertise, natural stone | Permalink. It’s easy to be overwhelmed by all the choices and the beautiful tiles when you first go to a tile showroom, so we thought we’d give you a few tips to consider as you’re making your selections. — Large tile is very popular right now, and it’s getting larger. We’re glad to install it for you, but it does require upgraded mortars and more time to ensure the substrate is appropriately flat and that patterns flow with the maximum full tiles possible. Therefore, your price will be a little higher for large-format tile (anything larger than 15″). Because most large tiles have some degree of curvature, we can’t install large tiles with anything less than a 1/8″ grout joint. — Glass tile and sheeted materials also require different setting materials (and tools in some cases), so there is usually a higher level of skill needed to install these materials. Many sheeted materials may not line up the same way non-sheeted materials will (grout joint widths will vary from one sheet to the next). The nature of the material will usually mean a little higher installation price for sheeted or glass products. — Accents and liners should be similar in thickness to the tile being installed. A good tile designer will steer you to products that line up well, so it’s important to take advantage of the talented showroom designers we have in our area. — Grout joints are routinely 3/16″, so if you want a different width, please discuss it with the designer and your installer. Some tiles require specific types of grout and joint sizes, so it’s important to be specific in what finish look you want. — Patterns, accents, and borders can add pizazz to a tile installation, so they are worth including in your plan. They do take more time to install, so your labor cost will increase each time you add an accent or extra feature. — Standard heights of showers are 7′, and tub surrounds are generally 5′ off the tub. If you want a different finish height, be sure to let your designer and installer know that. — Niches are more popular than soap dishes these days, and most showers now contain a shelf or foot prop, so be sure to specify which of these you’d like to add to your project. Waterproofing is needed behind that niche, and the best installers will be sure your design flows seamlessly through the indentation. There’s a little extra charge for these items, but having an easy place to keep your shampoo and soap is priceless! Categories: Ceramic tile, Glass Tile and Natural Stone, Installing tile and stone, Tile installation expertise | Tags: accent tile, Glass tile, grout joints, large tile, Local tile expertise, natural stone, Questions to ask a tile installer, shower niche, Tile standards | Permalink.